It's an absolutely astounding career in music. Rosa Rio was picking out melodies on the piano when four years old, & chording melodies at six. She had to wait until eight before a teacher would begin giving her music lessons, but was already adept at improvisation. When nine years old, she was asked to play piano accompaniment for a silent movie in a theatre, with the instructions "play loud & don't stop." Her father removed her from the bench with an admonition that "The theatre is no place for a girl." This girl had a different idea about that, though. Her parents enrolled Rosa at Oberlin College in Ohio, to prepare her for a career as a music teacher. While visiting an aunt in Cleveland, she for the first time saw a theatre organ rising from the pit & was enthralled. She then knew what she wanted to do. The Eastman School of Music in Rochester, New York, established by Eastman Kodak magnate George Eastman, maintained "a department for special instruction in the art of motion picture accompaniment". 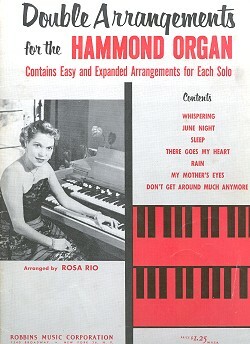 Rosa Rio enrolled there, & was a student of organist John Hammond. Later, Rosa Rio & John Hammond would marry. After completing her instruction at the Eastman School of Music, Rosa Rio took her first job as theatre organ accompanist at a theatre in Syracuse, New York. Then, successive posts at Loew's houses around New York City; including the 3100 seat Loew's Burnside,the 2300 seat Loew's Willard in Richmond Hill, Long Island. Next, she moved to New Orleans, studied piano with Vit Lubowski, & began her tenure with the Saenger theatres. She held the house organist position at Saenger's Strand in New Orleans, was a feature organist at the New Orleans Saenger Theatre, & toured all the Saenger houses. 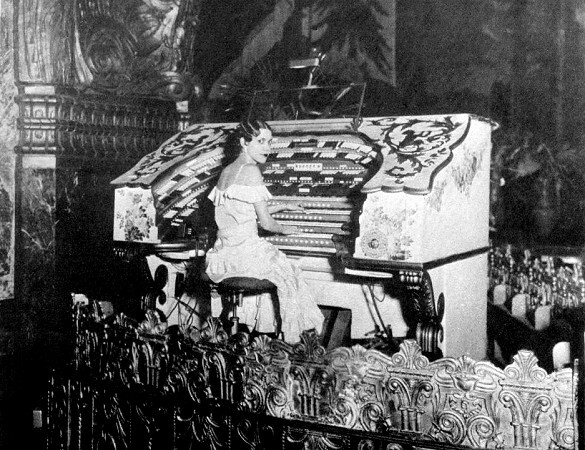 Afterwards, she took a position at the Paramount theatre in Scranton, Pennsylvania, & in 1933 became the house organist at the Brooklyn Fox Theatre, playing the second-largest theatre organ built by Wurlitzer. 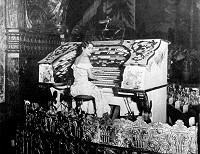 When the Fox organ was retired, she played at the RKO Albee, Brooklyn Paramount, RKO Patio theatres, & the Crown Theatre in New London, Connecticut. As the heyday of the theatre organ waned, Rosa Rio also worked as an accompanist & vocal coach for singers of operatic & popular music. One longtime friend, Mary Martin, got her big break at an audition accompanied by Rosa Rio: Mary Martin sang "My Heart Belongs to Daddy" for Cole Porter, & was cast in the Musical "Leave It To Me". But while live accompaniment of films diminished, radio was burgeoning with opportunities. Radio drama utilized live accompaniment, there were fills & themes to play in newscasts, & entire programs of live music. Rosa Rio was engaged to perform as a staff organist for the NBC radio network, & landed a staff assignment on New York ABC station WJZ. 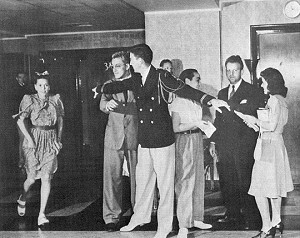 With just 60 seconds between shows, Rosa Rio races between studios at NBC in 1942. With television's ascendancy, many radio programs folded or moved to the new medium. Rosa Rio played a few shows for TV, including Appointment with Adventure, Bert & Harry, Brighter Day, Family Happiness, Mr. Jelly Beans, & the Today Show. 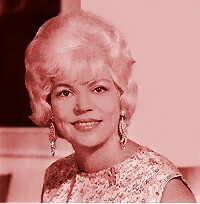 In 1960, having remarried, Rosa Rio moved to a new home in Connecticut. The house was outfitted with a large music room & recording facitlities, & it was the new base from which Rosa Rio continued to play, teach, publish musical arrangements, & record. She continued to make excursions to conduct theatre organ workshops & accompany films, & to play concerts, occasional radio shows at stations in Ansonia & New Haven, & even a command performance for Dag Hammerskjold at the United Nations. Many people know her work through her excellent accompaniment of a large number of silent films originally released for home viewing on videotape. Rosa Rio now lives in Florida. An excellent pianist as well as organist, she continues to tour: performing concerts, accompanying silent films, & hosting workshops. She frequently performs at the Tampa Theatre. Play loud, and don't stop. Music at the Saenger Theatres, with some selections from Rosa Rio at the New Orleans Saenger Robert Morton organ!